Timer with max 60 seconds grind offers more uniform grind. Baratza virtuoso is a good option for your regular home use grinding. It has upgraded its consistency and grinding speed and more you get 40 grind setup. Having some drawbacks cannot lessen its value on the market in consideration with high quality burr grinder service. All in all, Baratza Virtuoso is a good product ever. If you are finding an exceptional high quality conical burr grinder for your creamy espresso, French pot, drip and other manual brewing, undoubtedly, I will give you a choice for Baratza virtuoso conical burr grinder. In addition, This Baratza brand does a very uniform grind for its special virtuoso burrs that stays durable and sharp for several years. Baratza virtuoso brings to you smoother and more consistent grind besides keeping your beans cool even when you grind for extended time. 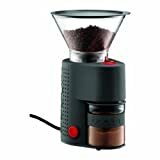 This very finely designed burr grinder delivers a front-mounted pulse button for the direct brewing into your espresso filter basket, 40 grind setup, an easy 60 second timer, 8 oz of bean hopper capacity with its 5 oz of grounds bean holder, 250-1200 microns wide grind range, an innovative calibration system, Powerful Dc motor and good 1.5-2.4 grinding speed with exclusive speed controller. You can use it in 110v ac 50/60 Hz if you are in North America and 230v Ac 50/60 Hz if you stay other countries. Furthermore, its metal top and base add an expensive, aristocratic looking to this grinder and of course high quality class that apart from other grinders. Baratza has upgraded the second generation gearbox into GB 2.0. Also now you can like its decreasing sound that somewhat annoying to somebody though its noise was not so as blade grinders. If you desire more setting option, virtuoso let you grind with 40 grind setting. From 0 to 40 dial for extremely fine to coarsest grind ensures espresso to press pot. To know you 0 is for espresso and 40 is for French press but it depends on your taste how you choose to make. And so just experiment with it which dial is best for you if you want espresso, French press, drip, chemex or others? 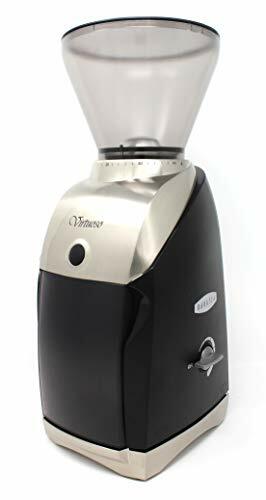 Virtuoso is basically a home grinder with its large hopper that can be filled with 3 cups roasted beans and ground pot that can hold typical amount of 1 pound that is one pot of coffee bin or 2 cups. As it is designed for home use, virtuoso is enough for one pot at a time. Don’t think it or treat it as a commercial grinder otherwise it’ll expire. Actually call it very good home grinder for home use. In almost all baratza grinders they feature this front mounted pulse button. Very convenience for direct brewing for your any espresso brewing basket. What you need to do to remove the ground pot, fill the hopper with bin, press the front button and ground coffee pour over into your holder-easy and good function. You can also purchase a porta filter holder if you desire to have it. 60 seconds timer really a win for virtuoso as some manufacturers suggest to grind for 20 seconds or more 40 seconds. And then should wait several minutes until the burrs are cool down. But virtuoso let you grind maximum 60 seconds on its timer. You’ll get about 1 or ½ cups ground coffee if you grind full 60 seconds though how many cups vary for your adjustable grind settings. Remember to wait sometime after 60 seconds full range grind and be sure burrs are cool after next grind. Timer knob fall-off: Issue on knob fall-off is a little bit messy. Some buyers complain the timer knob falls off when they use it even after light use. Some find a way to fix it. What you need is a scotch tape, toothpick or paperclip. First cut out a small thin tape, put out the knob and you will find a bisector in the end. Now stick the tape to the one side of that knob, fold it with the paperclip and adjust the tape to the other side, that’s all done. How much anti-static: If you come to the point of static, all grinders do the same though virtuoso is less messy ensuring maximum freshness of your coffee beans. Cleanup the grinder is also fairly easy. Though many users are using this baratza virtuoso for many years, say 2 /3 yrs and even 5 yrs, some buyers claim it a short life-span grinder from the price point. Price range is $220-$240. I say duration depends on your use. Remember I warned that don’t use it for commercial purpose as it is home grinder. Overall customers score it average 4.5.